Chicago’s largest building permit issued since the slow-up in construction reached its low level was taken out at the City Hall yesterday for the new $12,000.000 Marshall Field office building. to occupy the entire block of frontage. on the north side of Adams street. extending from LaSalle to Clark. In this connection it was learned that bids for steel for the first unit of the big project will be asked for within ten days. Contracts will be awarded during the summer, with the actual work to start Nov. 1. A last minute change In the plans was decided on yesterday when the architects, Graham, Anderson, Probst & White, were Instructed that there ll be no thirteenth floor. That doesn’t mean there ll be any engineering prob- lems involved: It merely means a ges- ture of deference to the superstitions of prospective tenants who balked at considering leasing offices on such a supposedly unlucky floor. In other words, the next floor above the twelfth will be the fourteenth. The new forty-two-story FIELD BUILDING, Chicago’s largest office structure. It is the first office structure in Chicago to be air-conditioned, the basements and the first four floors being so equipped. It also is the first local office building to have concealed radiation, and to be equipped with truscon aluminum windows. A modern drinking water system provides a fountain unit for each office, and for the first time in the Loop alternating electric current is provided. This forty-three story structure will be the largest office building in Chicago and one of the biggest in the country. It will be erected in two units, with the old Home Insurance company building, at the northeast corner of La Salle and Adams to be torn down first. The W. J. Newman company has the wrecking contract for the removal of this old timer. It is planned to have this first unit ready for tenants by 1933. The occupants of the Standard Trust building, at the northwest corner of Clark and Adams, will then move into the new section, if the on the job renting agents for other loop skyscrapers haven’t persuaded them to move elsewhere. The second unit wIll comprise a section similar to the first unit and in addition will contain the tower section. which will be as large itself as many loop skyscrapers. It is announced that this second section will be ready for occupancy In the spring of 1934. The new Field building will not only be the last word In structures erected in 1931. but as it is being built over a period of three years and many novel and important office building improvements and refinements both in operation and construction are how being developed, it will have many innovations lacking In any other Chicago structure now standing. For instance, as already stated, it probably will have the double unit system of elevators, which permits two cars to operate In the same shaft at the same time. In this connection it is possible that the newest New York idea of having escalators to the second floor will be installed. This, however, has not yet been decided. Moving stairways from the . floor to the basement and to the second floor and perhaps the third, it is pointed out, would give these stories almost the same accessibility as the ground floor. JA the basement may have the same arcade extending from La Salle to Clark that the first floor will have, an escalator at each end would have the effect of making the lower level thoroughfare almost as eary to reach as the first floor. The new Field building will have the largest bank of elevators of any office building In Chicago. There’ll be forty-two lifts, and it the double car system is used it ll have eighty-four cars. Robert Carpenter, manager of the Conway building, will have charge of the new Field . He states that renting arrangements already are under way. 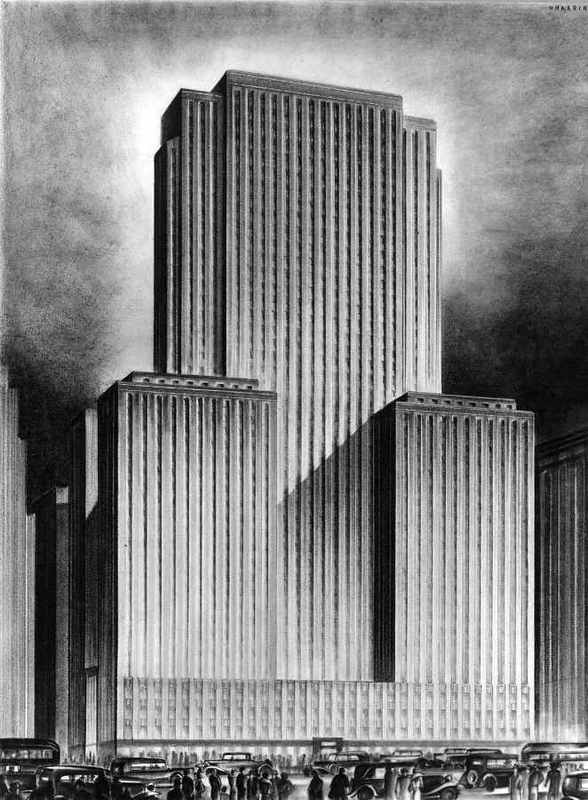 Chicago’s first air conditioned loop skyscraper will be the new Field building, according to an announcement made yesterday by George Richardson, trustee of the estate of Marshall Field. The basements and first four floors of the 42 story structure will be supplied with fresh, cool air in summer from ten to fifteen degrees lower thai outside, and with warm, pure air in winter. 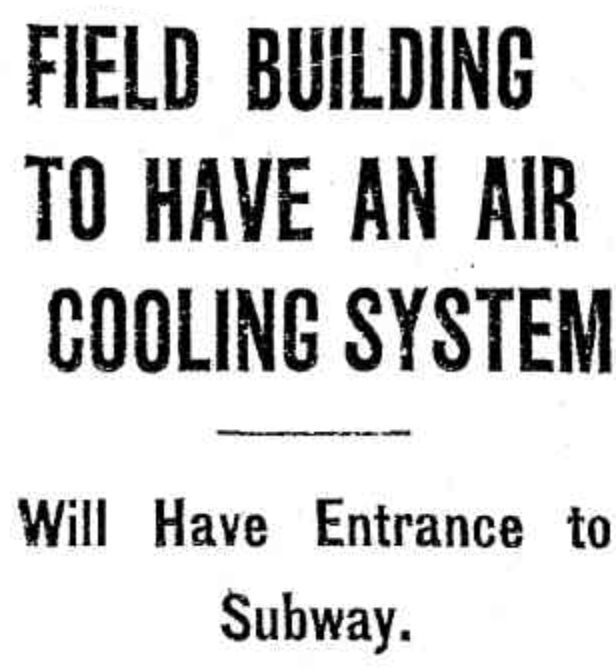 Air conditioning has been in operation in office buildings and department stores in Detroit for several years but this will be the first use of this modern comfort in this class of loop structure. Another feature new to large loop structures will be alternating electric current which will enable tenants to enjoy the advantages of electric clocks, radios, and other electrical devices. Mr. Richardson, being an optimist and believing that some day Chicago will have a subway, has had provision made for an entrance from the basement to underground train service beneath Clark street. This section of the Field Building is erected on the site of the Home Insurance Building, which structure, designed and built in eighteen hundred and eighty four by the late William Le Baron Jenney, was the first high building to utilize as the basic principle of its design the method known as skeleton construction and, being a primal influence in the acceptance of this principle was the true father of the skyscraper, 1932. 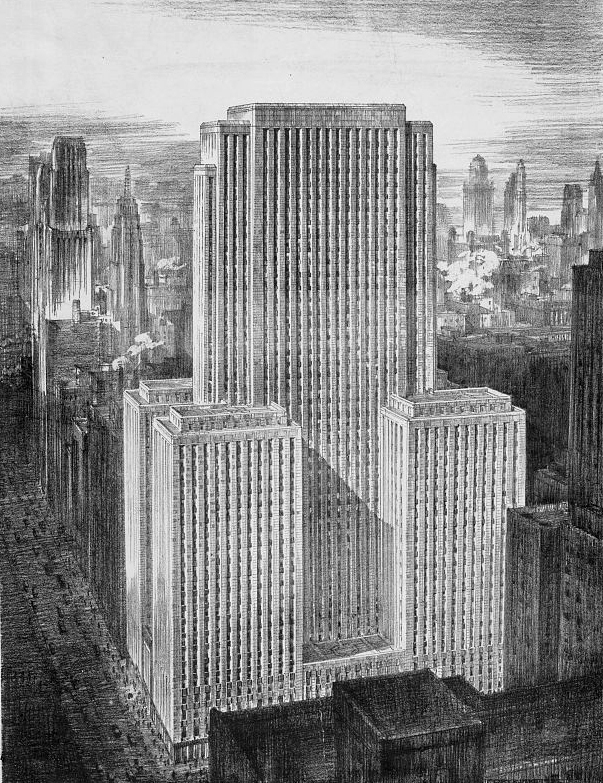 Planned at the height of the roaring ’20s and built\ in the depths of the de- pression, the towering Field building at 135 S. La Salle st. rang down the curtain on a great era of Chicago building. Not until the Prudential went up nearly 25 years later did any new skyscraper challenging it in size appear on the Chicago sky line. 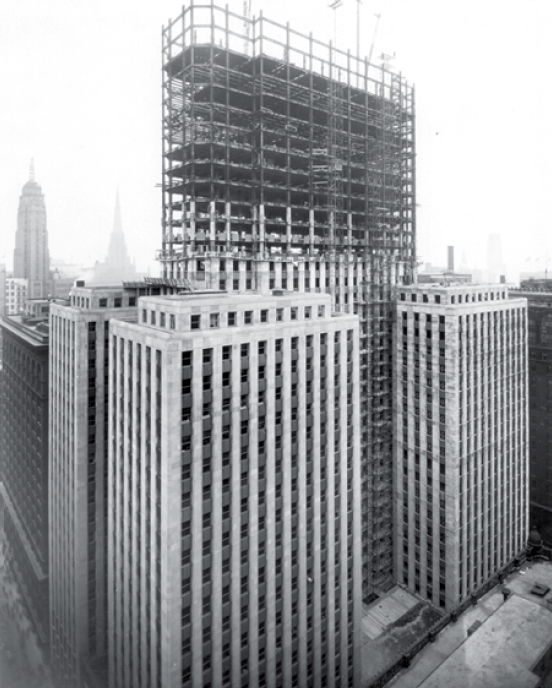 When the Field building was under construction in 1933, it was the only major office structure going up not only in Chicago, but in the entire country. Into the terrazzo mosaic floor or the lobby and elsewhere thruout the Field building was worked a simple design—two capital letters “F” standing back to back. “Field’s Folly,” of course, became the popular translation in those times. It cost the estate of Marshall Field 15 million dollars to erect the Field building; replacement value today is estimated at 50 million dollars. Since 1942 the building has been nearly 100 per cent occupied, the current figure being 99.7 per cent, according to Richard M. Palmer, president of Robert Carpenter & Co., manager of the property. THE building was designed by the Chicago architectural firm of Graham, Anderson, Probst & White. It occupies half a city block fronting on La Salle, Adams, and Clark streets. On the La Salle side formerly stood the Home Insurance building, conceded to have been the first skeleton frame building in the world. 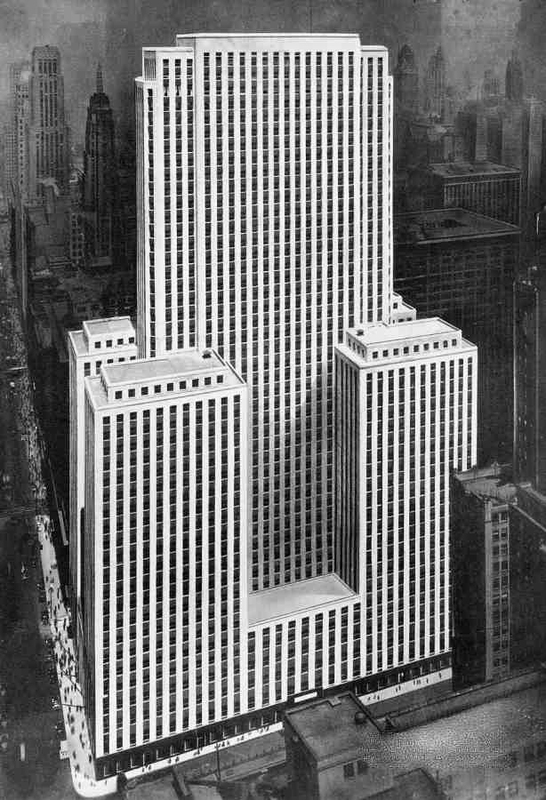 The Field building went up in three sections—the La Salle street portion, completed in 1932; the Clark street unit, 1933; and the tower, 1934. The floor numbers go to 44, but since there is no 13th, the building actually is 43 stories high, up 535 feet from the sidewalk level. George A. Fuller company, which had built the Home Insurance building in 1885, also was general contractor for the Field building. Straight vertical lines give the building a look as new as 1959. The main exterior material is limestone. The lower and entrances made extensive use of white bronze and black granite, also with a complete lack of extra- neous detail. As far as materials and craftmanship are concerned, another Field building may never be built, architects say. The cost would be prohibitive. Three kinds of marble were used in the vast lobby arcade and corridors—white, from Vermont; a green variety, from Italy; and a delicately toned tan marble, also from Italy. The first five floors were air conditioned at the time of construction. In recent years the air conditioning has been extended thruout the building. 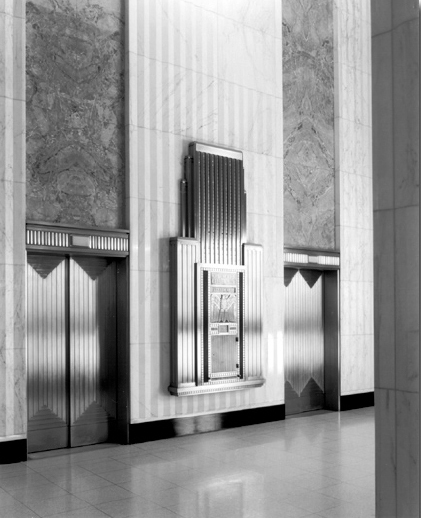 The Field building was the first office skyscraper with a built-in vacuum system and the first with aluminum windows. It has its own distilling plant for supplying chilled water. More than 270 firms have offices in the building, the major space users being Zurich Insurance company, W. A. Alexander & Co., General American Transportation corporation, Continental Can company, and La Salle National bank. The building maintains one of the city’s largest law libraries, with 25,000 volumes, for its law firm tenants and others. The securities business is represented by such firms as Halsey, Stuart & so., Blyth & Co., and Glore, Forgan & Co.
With 1,051,874 square feet of rentable area, the Field building is one of the largest office skyscrapers in Chicago. Up to 9,000 persons work in the building and daily elevator traffic runs to 150,000 persons. The building manage- ment and maintenance staff numbers 325. 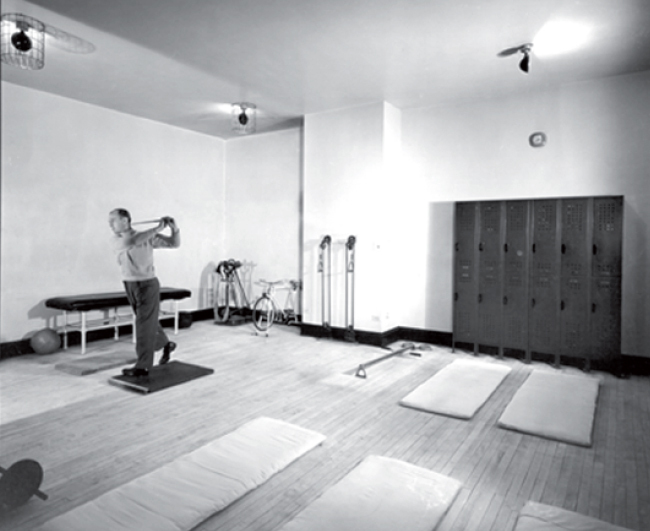 When the Field estate terminated, the property was taken over by the late Marshall Field III who gave it to Field Foundation, Inc., in 1947. N. W. Ayer & Son, Inc., have leased part of the sixteenth floor in the cast of the Field building for a term of years and will move there from the Federal Reserve Bank building. According to Sterling E. Peacock, resident vice president in charge of the Chicago office, an extensive special layout will be completed on Feb. 1. 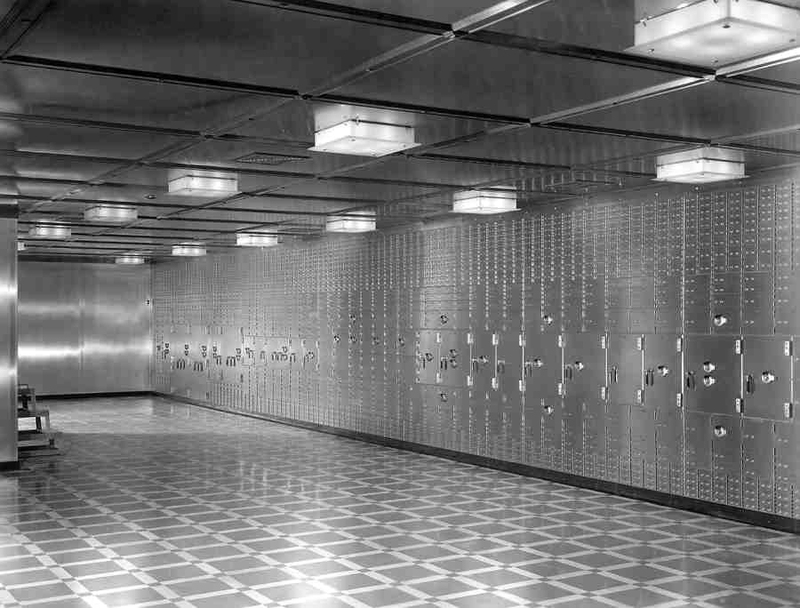 The advertising agency has occupied its present headquarters in the Federal Reserve Bank building since 1922.